The grange is hosting a Royal Wedding Party with all lounges decorated in theme and a traditional buffet lunch served during the service. Drinks will be served all day throughout the celebrations. All Family Members and Friends are more than welcome to attend. The Grange & Lyndhurst can now supply iron on name tags for our existing and new residents clothes courtesy of a company called ‘My Nametags’. My Nametags helps care homes manage residents’ clothing better, by permanently labelling all clothing. There labels are used by a large number of care homes and nursing homes and have been used by more than 750,000 users. The labels carry a 10 year washing guarantee so guarentees clothing is distributed to the correct person. I am very pleased at the quality and progress of the flowers we have in The Grange’s garden this year. Already we have most beds full of colour and variety. I must congratulate Batista the Handyman/Gardener for all his tremendous effort and skills, he truely does have green fingers. 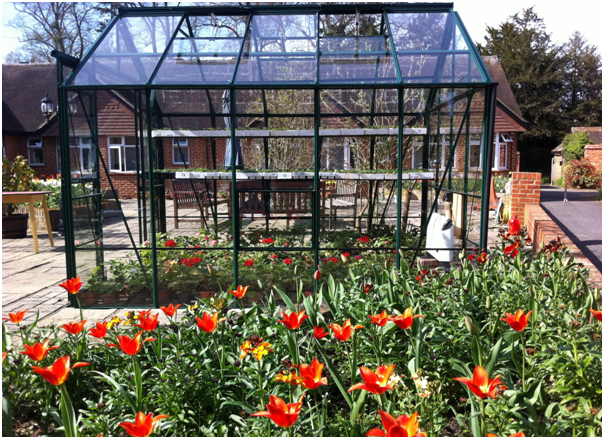 I posted a blog last year about the new greenhouse for residents to particiapte with the potting and care for the plants, and I am very pleased with the progress and effort made by all our residents. I have uploaded a photo for everyone to see of the outside patio beds and greenhouse.